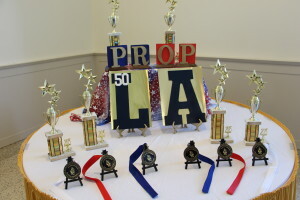 On Tuesday, October 6th, 275 students in Grades 9 through 12 from Jefferson, New Orleans and St. Bernard Parishes, participated in the 50th Anniversary Louisiana Propaganda Tournament. These three leagues all branched from the original Academic Games league that began in New Orleans in the 1966 – 1967 school year. In celebration of 50 years of Academic Games in Louisiana, these students and their moderators all came together at Brother Martin High School to participate in the first game ever played in Louisiana—Propaganda. This is the first “state” Propaganda Tournament since the year following Hurricane Katrina when all three leagues were awaiting students to return to their homes and schools. At the beginning of the tournament, Brother Neal Golden, head of the New Orleans Academic Games League and 50th tournament organizer, spoke to all those present about the formation of Academic Games in Louisiana. Brother Neal relayed his memories about the first Propaganda tournament and read a letter from Mr. Larry Liss, the national tournament manager, who was also present at the first Propaganda tournament in New Orleans held at Mount Carmel Academy. Students at the 50th Louisiana Tournament received awards for placing in the Top 3 of their division for being the highest overall individual scorers and/or the highest overall combined team scorers. Students were recognized at the end of the competition in an awards ceremony for all of their achievements and for taking part in a very special event. All of these students’ scores will count towards their league’s respective qualification procedures to the 2016 Academic Games Leagues of America National Tournament.